JRP Tree & Demolition is your top choice for demolition services. Why? Well, there are a few answers to that simple question. Here’s why you should count on JRP Tree & Demolition for your next demolition project. JRP Tree & Demolition is headquartered right here in Houston, and we provide demolition services here in the city and throughout the local area. If you’re looking for a local business to perform your next home demolition or commercial demo, we’re as local as it gets. Our business is also family owned and operated, which means that we’re an outfit you can trust. When it comes to demolition, experience counts. And we bring plenty of experience to the table—nearly 30 years in fact. Our experience ensures that your project is completed safely. In addition, our experience helps us to complete projects on time and within your budget. Rest easy knowing that our employees are properly insured in the case where there’s an accident. 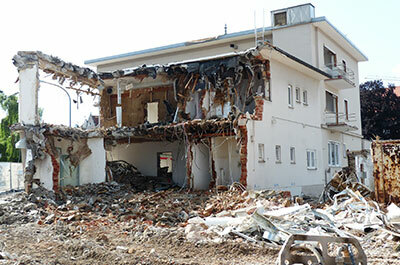 Demolitions can be dangerous; with JRP Tree & Demolition, our clients stay as safe as possible. Demolition can be a nightmare with the wrong tools, and a breeze with the right tools. We utilize heavy equipment, including backhoes, bulldozers, and skid-steers, in order to safely and quickly demolish buildings. Our services don’t stop at demolition! That’s why we’re called JRP Tree & Demolition. We provide tree services as well as our demolition and excavation services, so that you can prepare your lot in one fell swoop. If, for instance, you’re looking to tear down your garage and some nearby trees to give yourself space to build a new barn, we can do it all. We’ll demolish your garage, remove your trees, and level your terrain so that you’re ready to get building. Here at JRP Tree & Demolition, we know that customer service counts. We value each and every one of our clients and we gain most of our business through word-of-mouth advertising. That’s why we strive to provide complete professionalism in our demolitions. We’ll work with your schedule and timeline to see your project through to completion. Find Out the JRP Difference Yourself! Still not convinced that we’re the best demolition experts in Houston? Well feel free to read our previous clients’ testimonials. If you’re ready to find out the JRP Tree & Demolition difference for yourself, don’t hesitate to get in touch with us to get a free quote for your project! Count on us for demolition, excavation, and tree care services.